In case you were wondering, I have decidedly unexotic and Catholic heritage- generic Irish/English stock on my Dad’s side and on my Mum’s side, half Northern Italian and half more of the same. I am, as they say, an anglo mongrel, and the food I grew up on reflects that fact. I am sometimes accused, mostly jokingly but with a dash of truth thrown in, of growing up ‘without culture’ by my partner, his heritage being a mix of Portuguese and Iraqi Jew now considered exotic. In a way, I think as Australians we shortchange ourselves when we say we have ‘no culture’. We have every culture, that’s the point, and we can serve it all up on a plate and pretend for five minutes that we are all friends. It solves nothing, but it feeds everyone. And there are things that I think all of us who love food understand. Many of the conversations we had growing up centred on food. What did you have for lunch, what should we have for dinner, have you eaten? These are universal questions for perpetually hungry and food-obsessed families, whatever their nationality. Food for me is mostly all about my mother. It is the same for my partner, on the phone to his mum trying to suss out exactly the right methods or ingredients to get that thing she made for him as a kid just the way she made it. If we cook something our parents used to make, and try to make it the way they would when we were kids, it is kind of ritual, a kind of homage. Whether that thing be a sausage sanger or a perfectly rendered matzo ball, we can chow down on each with equal gusto. 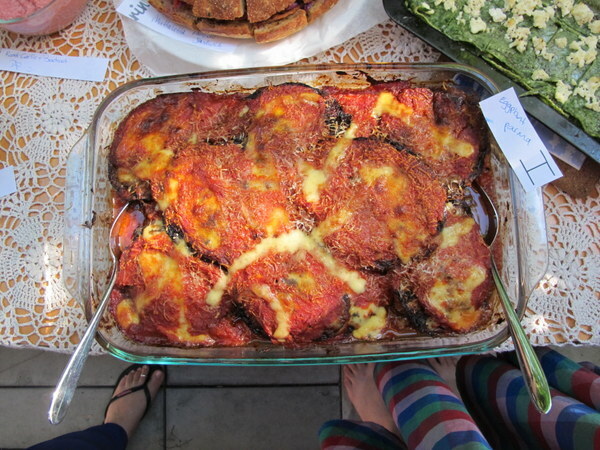 This recipe is basically eggplant parma, a combination of a traditional eggplant fritter recipe from my Grandfather’s family and the tomato sauce that we would eat in some form at least once a week when I was growing up. I would happily subsist on slow-cooked tinned tomatoes for the rest of my life, and this is one mind-numbingly delicious way of serving it. Serves 8 generously, if served with salads and sides. Tip: You can either make the sauce first or take the ‘do everything at once approach’ outlined below, just keep in mind that the sauce should cook for at least an hour. The whole dish can be made a few days in advance; once everything is layered together, refrigerate and when you want to serve it, bring it up to room temperature before cooking. Salt the eggplant slices well, layer on a plate and place a heavy object on top. 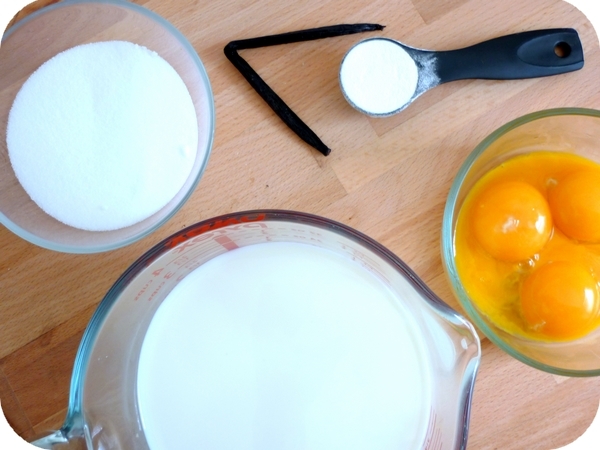 Arrange three bowls on the bench, 1 with the flour, 1 with the beaten egg, and 1 with the breadcrumbs. Leave the weighted eggplant slices to sit for 20 minutes. Heat the oil in a large pan. Cook the onions until translucent, then add the salt, chilli flakes and garlic. Cook until all ingredients are done but not brown. Add the wine to deglaze the pan, cook a couple of minutes. Add the tomatoes, give the tomato tins a bit of a rinse and pour the resulting water in too. Simmer the sauce for 45 minutes – 11/2 hours, adding in the rosemary about halfway through. While the sauce is simmering, rinse the eggplants and pat dry. Heat the oil in a large frying pan to shallow fry the eggplant. Then it is just a matter of dipping each eggplant slice in flour, then egg, the breadcrumbs and popping them into the oil. Turn each slice over so it browns on both sides, and when done, put the slices on a plate lined with paper towel to drain well. This process takes about the same amount of time as simmering the sauce. Remove the rosemary from the sauce, give the mixture a quick blitz with a stick blender if too lumpy, and leave to cool. Preheat the oven to 180 degrees C. In a large baking dish, layer the sauce, then the eggplant slices, then the mozzarella and then the parmesan romano until the dish is full or the ingredients are exhausted – whichever comes first. Bake for around 45 minutes or until the top is browned.